The Fiji National Provident Fund (FNPF) yesterday, announced the acquisition of the Marriott Denarau tourism assets. These include the 297- room Sheraton Resort, 246-room Westin Resort, and the 111 hec­tare Denarau Golf Course and Development Land. FNPF acquired the assets from Marriott International at a non disclosed substantial amount and this adds to FNPF’s existing impressive stable of hotel assets that include the recently-opened Fiji Marriott Resort Momi Bay, the Intercontinental Fiji Golf Resort & Spa – home of the Fiji International Golf Tournament, Holiday Inn Suva and the Grand Pacific Hotel. Fund Chairman Ajith Kodagoda said: “This is a huge investment in Fiji’s major tourism destina­tion and an investment which the Fund and our members can be proud of. “The Denarau hotels have been operating profitably over the years and are expected to provide good returns to our members. The Development Land presents an even bigger investment oppor­tunity and the Fund will explore ways to capitalise on this. “FNPF as a Fijian institution had followed proper traditional protocols and advised the Yavu­sa Navatulevu, Sila and Nabati (iTaukei landowners) of our in­tention to acquire these assets from the start. The assets boast a prime beach­front location on the north-west­ern tip of Denarau Island – Fiji’s premier tourism and leisure des­tination. Denarau is the most established and high-profile tourism destina­tion in Fiji and benefits greatly from its close proximity to Nadi International Airport and the De­narau Island Convention Centre, the largest conference facility in the country. Fiji’s popularity as a modern, clean, friendly and safe holiday destination has seen visitor num­bers to Fiji boom in recent years, particularly from the Australian market. According to recent statistics, the future is extremely positive given the stable governance, tropical climate, proximity to Australia and New Zealand and substantial increase in flights in recent years from not only Aus­tralia but also Japan, Hong Kong, the US and Singapore. The Fijian Government has also invested significantly in tour­ism infrastructure, including substantial upgrades to the Nadi International Airport Terminal and the recently completed high­way direct from the Airport to Denarau. 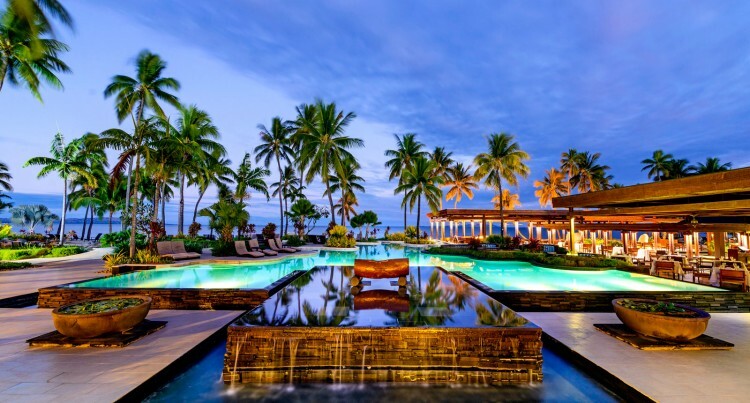 The five-star Sheraton Fiji Re­sort opened in 1987 and is built around a substantial lagoon pool complex and includes a selec­tion of dining outlets and bars, including one of Denarau’s most popular restaurants -Flying Fish. The property also features nu­merous retail outlets, six swim­ming pools, a fitness centre, kids club, business centre and wed­ding chapel. The Kitchen Grill, a popular wine bar and grill, as well as six tennis courts, four swimming pools, a day spa, fitness centre, bowling green and retail outlets. The Denarau Golf & Racquet Club encompasses over 111 hec­tares and includes an 18-hole championship golf course as well as a substantial clubhouse facility, a tennis centre and an abundance of surplus land with upside potential for future devel­opment. Marriott International will re­main as operator of the assets well into the future, further en­hancing their existing relation­ship with FNPF via the Marriott Momi Bay. Mr Kodagoda commented that “The Sheraton and Westin, whilst already two of the most popular resorts in Fiji, will be further enhanced with signifi­cant refurbishment of both in the near future. “FNPF are committed to en­hancing these assets to maintain their premier positions in the Fi­jian tourism market.